I think it fair to say that the most striking and vivid symbol one encounters in all of Catholic religious imagery is the Crucifix. Yet it is so familiar that we at times run the risk of becoming inured to the true power of its message. Nevertheless, it is absolutely central to the logic of Christianity: for Christianity without the Cross of Christ is in fact devoid of value. I think that part of the reason for the dulling of our appreciation of the crucifix is that we tend to sanitize it, so to speak. And we tend to sanitize it because we fear it. We have lovely crucifixes, carved in Bavaria, hand-pointed and with gilded edges. They are clean and even beautiful at times. We wear them around our necks, sometimes displaying them nicely in 18K gold against our Florida-tanned skin. In other words, something within us seeks to take the bite out of this image of a tortured man pinned cruelly to harsh wood by cold nails; a man mocked and spat upon, with his skin torn and bleeding; with a crown of needle sharp thorns pressed into the tender flesh on his head. It's understandable enough because such is the desire of unregenerate man: we want the glory of the Cross without the suffering that makes it glorious. Some have gone even further and have not only purged the images of the Crucified Lord of any unpleasantness, but have actually liberated Him from the iron nails completely, as if to say, "My Lord, you do overstate Your point". I even heard of a church that had replaced the corpus of its crucifix with a statuesque butterfly, as if Jesus were not a man after all, but a caterpillar. Then there is the "Precious Moments" crucifix! I think that part of the antidote to this spiritual pathology can be found, artistically at least, in Latin America. There you can find crucifixes so vivid and lifelike that one's first reaction upon beholding them is to wince and to hide one's children from them. There you well can imagine Our Lord with the body so bloody there is scarcely any skin that can be seen; with the bone of the kneecaps exposed; with glass eyes searching in agony, with human hair glued to the head. I recall the parish church in Querétaro, Mexico, where I offered daily Mass for a month last summer, while participating in a Spanish immersion course in that city. 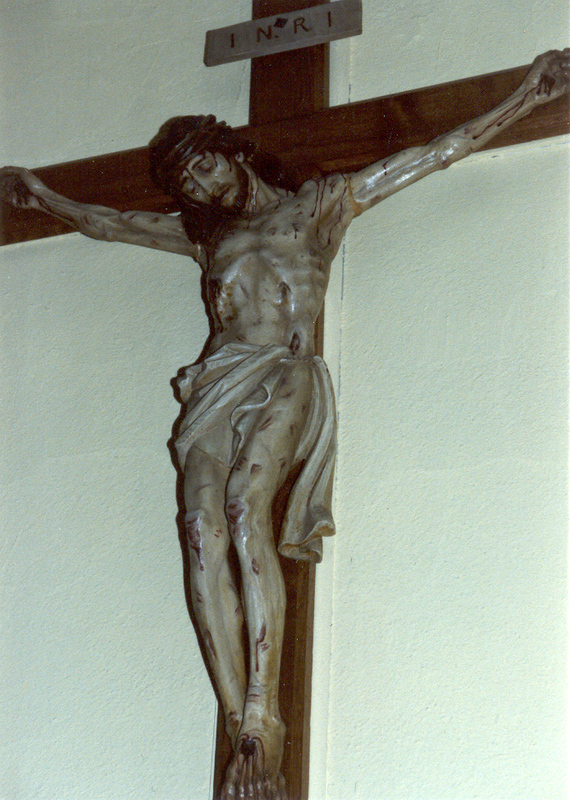 In the sacristy hung a life-size crucifix, depicting the reality of the crucifixion. It was a sobering image to confront each morning prior to Mass. The corpus was so bloody and beaten, one could not help but cringe as you passed underneath our Lord's lifeless gaze. It's as if the crucifix put you at the very foot of the Cross on that original Good Friday. One could even peer into the gaping hole in our Lord's side and see his pierced heart! Without words, this depiction exclaimed: This is the distance that He went to die for you and me! Now there is one particular episode in Christian history that illustrates this very movingly, and sticks in my head. Some of you may have heard of the French Carmelite nuns of Compiègne who, during the Reign of Terror in Revolutionary France, vowed to offer their lives as a sin offering to God for an end to the hellish bloodletting perpetuated by the advocates of Liberté, Equalité et Freternité. There is in fact an opera by Francois Poulenc called The Dialogue of the Carmelites which has told the story on the stage. The Terror, you may recall, was a fanatical antichristian fury that was fueled by the blood of thousands of priests and religious; that smashed the priceless stained-glass windows of ancient churches; that dug up and desecrated the bodies of saints; that erected a platform over the sacred high altar at Notre Dame de Paris and there enthroned a prostitute to mock God; and then even eradicated the 7 day Biblical week and replaced it with a 10 day version that had no reference to God. The nuns of Compiègen, knowing of this reign of sacrilege, were faced with the decision to scatter and hide, or to face the Terror. Famously, they chose the latter and did so with the explicit intention of vanquishing it and its principle architect, Robespierre. There were 16 of these Brides of Jesus Christ, and they stayed in their convent and awaited the day of battle. It soon came; they were arrested on trumped up charges of counter-revolutionary activity and led by wagon to the Place du Trone where the guillotine waited to consume them as it had thousands before. It is said that the evil aura of the place and the stench from the rotting blood was so horrible that it was difficult even to prod the horses into the square. But the 16 Carmelite nuns entered the site with perfect serenity, chanting hymns to God and the Blessed Virgin Mary. The usually raucous crowd, inebriated with the killing, fell silent that day at the spectacle of such women. They were called to the scaffold one by one. And each nun in turn knelt before Mother Superior and said, "Permission to die, Mother?" To which Mother Superior responded by holding out a small statue of our Lady for the nun to kiss one last time, and was sent off with the words, "Go, my daughter". That was on July 17, 1794. That very week the tide turned against Robespierre and on the tenth day he lost his own head at the very same guillotine and the Terror sputtered to an end, defeated ultimately. I firmly believe, not by a Christian army, but by 16 holy women who understood perfectly the logic of the Cross of Jesus Christ. My friends, the history of the Church is replete with tales of this kind of self-sacrificial love. They are not all as glorious as that of the Carmelite Nuns of Compiègne, but they all participate in the same vision of one degree or another. It is true. I stand at the door of your heart, day and night. Even when you are not listening, even when you doubt it could be me. I am there. I await even the smallest sign of your response, even the least whispered invitation that will allow Me to enter. And I want you to know that whenever you do invite me, I do come - always and without fail. Silent and unseen I come, but with infinite power and love, and bringing the many gifts of My Spirit. I come with My mercy, with My desire to forgive and heal you, and with a love for you beyond your comprehension - a love every bit as great as the love I have received from the Father. I come, longing to console you and give you strength, to lift you up and bind all your wounds. 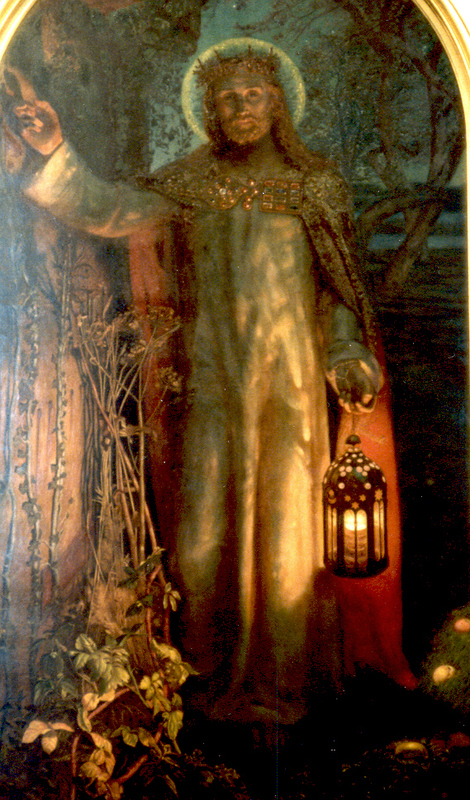 I bring you My light, to dispel your darkness and all your doubts. I come with My power, that I might carry you and all your burdens; with My grace, to touch your heart and transform your life; and My peace I give to still your soul. I know you through and through; I know everything about you. The very hairs of your head I have numbered. Nothing in your life is unimportant to Me. I have followed you through the years, and I have always loved you, even in your wanderings. I know every one of your problems. I know your needs and your worries. And yes, I know all your sins. But I tell you again that I love you, not for what you have or haven't done. I love you for you, for the beauty and dignity My Father gave you by creating you in His own image. It is a dignity you have often forgotten, a beauty you have tarnished by sin. But I love you as you are, and I have shed MY blood to win you back. If you only ask Me with faith, My grace will touch all that needs changing in your life; and I will give you the strength to free yourself from sin and all its destructive power. I know what is in your heart; I know your loneliness and all your hurts; the rejections, the judgments, the humiliations. I carried it all before you. And I carried it all for you, so you might share My strength and victory. I know especially your need for love - how you are thirsting to be loved and cherished. But how often you have thirsted in vain, by seeking that love selfishly, striving to fill the emptiness inside you with passing pleasures - with the even greater emptiness of sin. Do you thirst for love? "Come to me all you who thirst . . " (John 7:37). I will satisfy you and fill you. Do you thirst to be cherished? I cherish you more than you can imagine - the point of dying on a cross for you. I thirst for you. Yes, that is the only way to even begin to describe My love for you: I thirst for you. I thirst to love you and to be loved by you; that is how precious you are to Me. I thirst for you. Come to Me, and I will fill your heart and heal your wounds. I will make you a new creation and give you peace, even in all your trials. I thirst for you. You must never doubt My mercy. My acceptance of you, My desire to forgive, My longing to bless you and live My life in you. I thirst for you. If you feel unimportant in the eyes of the world, that matters not all all. For Me, there is no one any more important in the entire world than you. I thirst for you. Open to Me, come to Me, thirst for Me, give Me your life, and I will prove to you how important you are to My Heart . . .
No matter how far you may wonder, no matter how often you forget Me, no matter how many crosses you may bear in this life, there is one thing I want you to always remember, one thing that will never change; I thirst for you - just as you are. You don't need to change to believe in My love, for it will be your belief in My love that will change you. You forget Me, and yet I am seeking you at every moment of the day - standing at the door of your heart, and knocking. Do you find this hard to believe? Then look at the cross, look at My Heart that was pierced for you. have you not understood my cross? Then listen again to the words I spoke there, for they tell you clearly why I endured all this for you: "I thirst . . ." (John 19:28). . . I have never stopped seeking to love you and to be loved by you. You have tried many other things in your search for happiness; why not try opening your heart to Me, right now, more than you ever have before. Whenever you do open the door of your heart, whenever you come close enough, you will hear Me say to you again and again, not in mere human words but in spirit; "No matter what you have done, I love you for your own sake. Come to Me with your misery and sins, with your troubles and needs, and with all your longing to be loved. I stand at the door of your heart and knock. Open to Me, for I Thirst for You." We adore thee, O Christ and we bless thee! Because by your Holy Cross, you have redeemed the world!